Launch was all we could have wished for. As a result, following launch, we only needed tiny trajectory correction maneuvers to put us on course for the Pluto aim point at Jupiter. On the way to Jupiter, the New Horizons team undertook a series of virtually flawlessly executed, multi-month spacecraft and instrument payload checkouts, an unexpected small-asteroid flyby, and behind-the-scenes preparations for our Jupiter encounter — which begins this month! Since I last wrote in this space, at the start of November, New Horizons has moved outward almost another 100 million miles — from roughly 4.1 astronomical units to almost 5 AU from the Sun. Our spacecraft continues to perform well, and tracking plots show we're right on course. Last month, the spacecraft ground team uploaded further updated fault protection and correction software. In November and December we concentrated on cruise science observations by our in situ instrument suite. In particular, the Solar Wind at Pluto (SWAP) and Pluto Energetic Particle Spectrometer Science Investigation (PEPSSI) plasma instruments have both been calibrating on and studying the interplanetary medium. At the same time, the Venetia Burney Student Dust Counter (VB-SDC) has been recording micrometeoroid impact data as the spacecraft traverses the asteroid belt to Jupiter. During this same time, we received two kinds of good news on our communications capability. The first was a successful test of our dual transmitter capability. This means that we can, beginning this spring, increase our data rates by a factor of 1.5 to 2 times what we had planned prior to launch. This will speed the downlink of both engineering and science data during cruise, as well as at all of our flyby targets—from Jupiter to Pluto to Kuiper Belt objects beyond. Also, as you might recall from my last post, in late November New Horizons flew almost directly behind the Sun as seen from Earth. This is called a "solar conjunction," and it causes interference with radio communications due to the competition between the spacecraft signal and the nearby Sun, which is a radio noise source to ground receivers during these times. (You can think of it as the spacecraft being in the radio glare of the Sun.) Although we conservatively planned on an eight-day communications outage due to the position of New Horizons, we found that our pre-flight radio interference calculations were very much on the safe side. In fact, we received data from New Horizons for much of this "blackout" period. Now that we've calibrated our communications capability through an actual in-flight solar conjunction, we know that future conjunctions, which along our trajectory occur late each year, will be less trouble and shorter than our first one — typically lasting just a handful of days. Turning now to 2007, our Jupiter encounter has just begun. In total the encounter spans six months, from January through June. In future columns, I'll provide many more details. I plan to write those at an increasing pace until we pass Jupiter at the very end of February. For now, I'll say that our mission and payload operations teams, working with our Jupiter Encounter Science Team (JEST), have been striving to plan and test more than 100 Jupiter observing sequences comprising more than 700 separate observations of Jupiter. 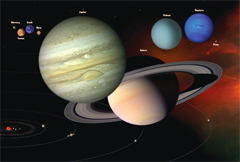 The first of these occurs January 5, with a Radio Science Experiment (REX) calibration using Jupiter. The New Horizons Jupiter Encounter press kit is scheduled for release mid-day on January 18, the day of our pre-encounter press conference. Check our Web site at http://pluto.jhuapl.edu anytime after then to get a copy. Over the next couple of weeks, PEPSSI and SWAP will continue to observe the interplanetary medium as we approach Jupiter, and Ralph and the Long Range Reconnaissance Imager (LORRI) will begin imaging the giant planet. If you're following closely on our Web site, you'll see us posting a New Horizons Jupiter "image of the week" beginning in mid-January.While this is all I want to say about our Jupiter encounter just now, I do want to tell you about our big picture plan for 2007. Most of the first half of the year is, as you might imagine, focused on the Jupiter encounter. But that isn't all we'll do. We also have two opportunities for course correction maneuvers — one in mid-February and one in mid-May. We'll almost certainly execute a trajectory trim burn in May, as our post-Jupiter encounter work settles down; that maneuver is currently estimated to cost us about 2 meters per second (5 miles per hour) in fuel. We could delay this maneuver until the fall, but it would cost more fuel then, because we'd be letting differences caused by our actual (non-perfect) Jupiter encounter aim point build up longer. Whether we'll need the pre-encounter February burn is something we'll decide in mid-January. I'll keep you posted. So far, it looks like we can skip that maneuver. After our Jupiter encounter, we'll also begin preparing for spacecraft hibernation, which will begin in July. I like to say that hibernation is the highway that will take us to Pluto. After all, we count on hibernation to both lower mission-operations costs and to reduce wear and tear on most spacecraft systems as we fly out to Pluto. Before we go into hibernation, however, we need to downlink all of the Jupiter data we collect and complete the last 10% (or so) of the instrument payload commissioning activities. Back in September, we put these tests off until spring 2007 to give our flight control team more time to concentrate on Jupiter encounter planning. In April, we'll also conduct a test run of spacecraft hibernation. Although we did this in ground testing, we want to gain some flight experience before the big plunge into long-term hibernation this summer. And when we do begin hibernation operations, we'll keep a close eye on the spacecraft health with multiple weekly Deep Space Network (DSN) passes for a few months, declining to weekly passes for another few months. In all, we won't settle into long-term hibernation operations until mid-2008. And meanwhile, from late September through late November, we'll wake New Horizons up for the first of our annual, two-month spacecraft and instrument payload checkouts. During this time we'll also conduct more cruise science observations, just as we'll do in subsequent annual wake up periods. Also this spring, we'll test some backup thrusters to alleviate the primary thruster overuse issue that I wrote about in my last update. And we'll once again uplink a few updates to our onboard fault protection and correction software, which continually matures as we fly our spacecraft. Finally, late in the year, from roughly December 11-17, we'll experience our second solar conjunction period, limiting radio communications again. As you can see from all this, 2007 is going to be a busy year for our operations team. In addition, our science team will be happily flooded, getting the Jupiter data reduced and archived, and analyzing the data to report initial results. Even our engineering team will be busy this year — building "NHOPS 2," a second New Horizons OPerations Simulator. NHOPS 2 will contain a replica of all spacecraft system and instrument avionics. We want it to serve as a ready-to-go backup in case anything breaks on our primary NHOPS 1 system during the long cruise to Pluto. It will also be useful for relieving some of the simulation load on NHOPS 1, which we seem to use 24-7. NHOPS 2 is scheduled to be complete by early 2008. As I close this column, I want to tell you about a very special occasion. 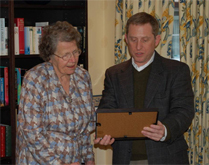 On December 19, mission co-investigator Dr. Mihaly Horanyi and I met just outside London and traveled to the home of Mrs. Venetia Burney Phair — "the little girl who named Pluto" as a primary school student back in 1930. Mihaly came over from Germany, where he is spending a sabbatical year; I was on my way to Italy to give a talk. Mrs. Phair, now almost 88, is an impressive lady — cogent, resolute and full of the verve of life. We got to know each other and shared stories at an Italian restaurant. Then she showed us her family albums documenting the events surrounding the naming of Pluto, almost 80 years prior. 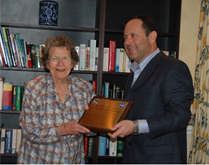 Then Mihaly (the principal investigator of our Student Dust Counter instrument) and I presented Mrs. Phair with plaques dedicating the SDC in her honor and commemorating an asteroid we asked the International Astronomical Union to name for her. 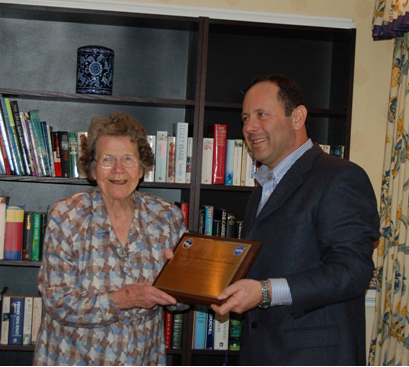 Mihaly also presented Mrs. Phair with a small model of New Horizons. Mrs. Phair, her son Peter, and several of their friends then joined us after these ceremonies for tea and cookies. It was fun to meet Venetia in person and to hear about how she came to name Pluto so long ago. She's healthy and witty and wishing for a chance to be at our Pluto encounter in 2015; that seems like something we should make happen. She also tells me she's always wanted to meet Patsy Tombaugh, widow of Pluto's discoverer, Clyde Tombaugh. It was a memorable day. Next time, I'll have another special item to write about: something we call "New Horizons kids." I'll say more in a couple of weeks. Well, that's all I have time to write just now. I'll be back with an update later in January as Jupiter nears. In the meantime, keep on exploring!